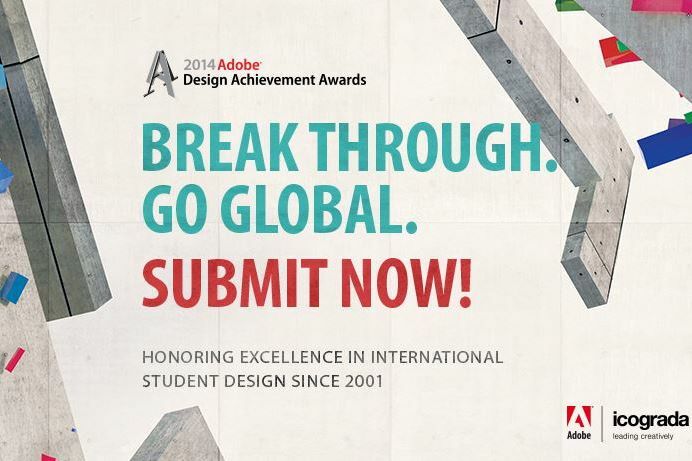 Passionate and interested designers who are students in an accredited institution of higher education are invited to apply for the Adobe Design Achievement Awards. The competition, which showcases individual and group projects created with industry-leading Adobe creative software, honors the most talented and promising student graphic designers, photographers, illustrators, animators, digital filmmakers, developers and computer artists from the world’s top institutions of higher education. an invitation to participate in the 2014 Adobe MAX held in Los Angeles. An original work must be included. It must be created not earlier than 1 May 2013, within one of the 11 Categories defined above. The work must be created primarily (50% or more) with the Adobe tools designated in each category, as stated above, and be accompanied by original digital files in Adobe software format. Click here to start the online admission process. ← Apply for the 2014 Iversity Scholartrip, to Study at your Destination for Free!